This is a hearty vegetarian stew which is a big hit in my home. Both my children enjoy this dish and its a welcome break from meaty stews. The lentils provide a good source of protein and iron while the sweet potatoes are packed with beta carotene. This stew is easy to digest and won’t leave you feeling like you need to take a nap afterwards! I like to crumble feta cheese on top but if you don’t take animal products it still tastes great without. I love to fill some crunchy cos lettuce leaves with any leftovers the following day which makes a delicious bread free sandwich! • 1 litre vegetable stock ( I make a ‘reduced salt stock’ by adding more water than suggested. I add 1litre of water to half a stock cube). To a heavy bottomed pot add the coconut oil and melt over a medium heat. Roughly chop the onion and add to the pot. Fry for 2-3 minutes and then allow the onion to soften by sweating for 5-7 minutes approx. Stir frequently. Meanwhile roughly chop the carrots and dice the sweet potato into discs of 1 inch thick. Divide each of these into quarters. Add the carrots and sweet potato to the onions and allow to sweat for a further 5-10 minutes stirring frequently to ensure the vegetables don’t stick to the pot. Add the grated ginger and cook for 1-2 minutes stirring continuously. Next add the spices and again stir continuously for 1 minute allowing their flavours to be released. Next add the tin of chopped tomatoes, lentils and stock. Bring to the boil and then reduce the heat to simmer with lid on. After 20 minutes remove the lid and cook for a further 20 minutes until all the vegetables are cooked. Transfer to serving dishes and crumble feta cheese on top. 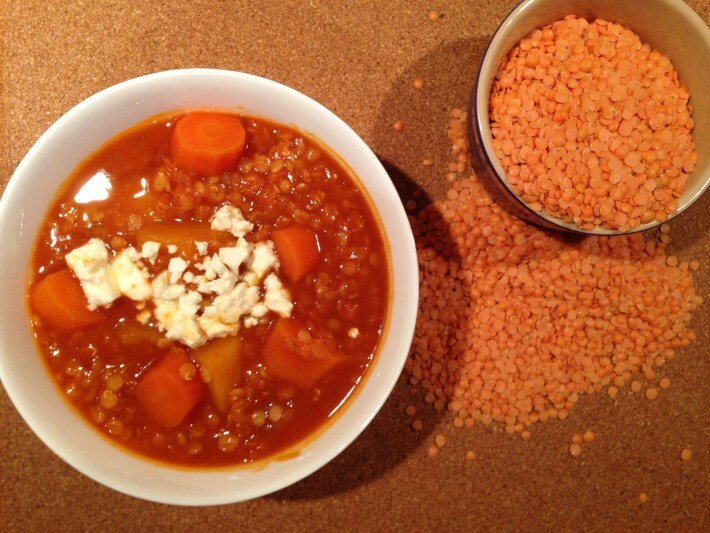 Lentils are a good source of protein, iron and B vitamins. They are versatile and can be used in dahls, stews, curries, soups and to stuff vegetables eg tomatoes and peppers. Being a good source of soluble fibre they keep you full and don’t peak your blood sugar which is good for diabetics. They also help reduce blood cholesterol due to the high soluble fibre content which is important for people with cardiovascular conditions. Beta carotene is absorbed better with some dietary fat so avocado is a good alternative to feta cheese. Fabulously professional blog Frances. I’m looking forward to trying out the recipes. The flab jacks are already a hit in my house. Great photo by the way!! Can’t wait to try this! Sounds delish! I’m going to try this recipe out on a few unsuspecting dinner guests tonight. Will let you know what they think!! My two guests Frances were delighted with dinner – one went for the avocado topping and the other the Feta cheese. Both thought the dish was wholesome but above all deliciously tasty!! PS – any idea as to what I can use the mustard seed’s I have left over for?